GOptions is an online broker dealing in binary options trading. It has been around for several years now. Seeing most binary options brokers are located in Cyprus and the United States, GOptions is one of the very few located in the United Kingdom with its main offices being in London. Its location makes it favorable to big money investors in the UK. GOptions is not a regulated broker, which is not surprising since most binary options brokers are not. It is however, a safe bet since a detailed map to their offices and official mailing address are provided on their website. This may contribute a lot to investor confidence since a business with an official Street address is seen as more reliable. GOptions was accepting US-based traders until late 2015. 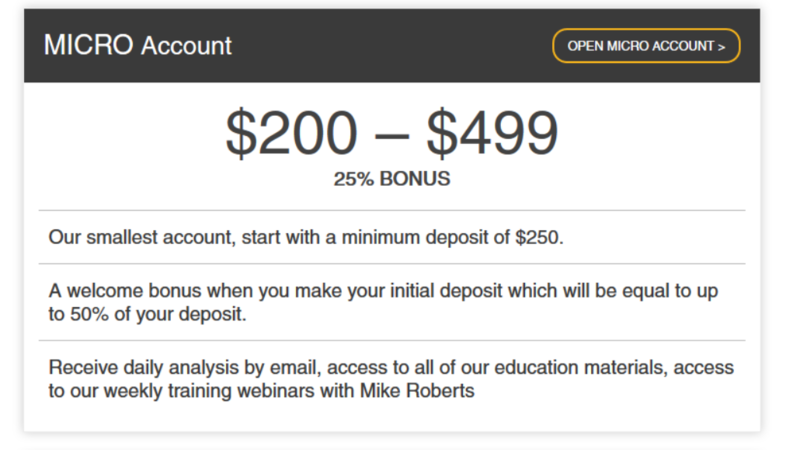 GOptions offers free demo accounts, personal account managers and weekly webinars to traders on signing up. The broker also has an amazing same day withdrawal policy which is the fastest in binary trading. To enjoy this, one needs to submit proper documentation (a clear photograph, a utility bill which is not older than 3 months and credit card information) for verification purposes and to avoid fraud. GOptions prides itself in having a professional customer support team. The team is comprised of former forex traders who have the experience and know-how to help and advice on almost everything. Traders can access support 24/7 on their live chat, email address, Skype or any of their toll free numbers. One can also submit their queries through their social media sites on Facebook and Twitter. GOptions uses the SpotOn platform which is arguably the best software around. SpotOn is quite popular among binary options traders since it offers a wide range of options not available on any other platform. This broker increases its performance by adding their own personal touch to suit their product. The platform’s efficiency is further emphasized with its easy-to-use interface and convenience since everything is done online and the trader doesn’t need to download anything. The platform also uses a Strategy Analysis feature to analyze three of the most popular indicators and provide a recommendation to the trader on the best strategy. One of the factors that traders look for in brokers is the payouts system or, in layman terms, the returns. These can make or break a broker’s reputation. GOptions clearly has that in mind as it offers payouts of up to 90%. This however depends on the type of assets traded in. Some assets generally have a large return on investment ratio while other have lower margins. Thus, for maximum profit, the right asses and the proper strategy has to be chosen. GOptions assures its clients of safe, fast and reliable financial transactions. This is somewhat credible since its parent company has been dealing in financial services since 2009. They accept credit cards like Delta, American Express, Maestro, MasterCard and Visa. One can also deposit or withdraw through the various e-Wallet systems available or through wire transfer eg. Skrill. They transact in almost all the major currencies available presumably to cater for all nationalities. They currently do not accept PayPal. GOptions has a wide array of accounts one can sign up for. The bonuses are paid depending on the amount deposited and the type of account. The different types of accounts are as listed below. For each account, the trader receives regular activity reports via emails. Micro Account – Basically the smallest account and easiest to open on the GOptions website. The account is free but a deposit of between $200-$499 is required. Bonus is 25% of the deposit. Mini Account – To sign up for this account you will need to make a minimum deposit of around $500-$999 with a 35% bonus. Standard account – Listed as the most popular account type on GOptions, the Standard account requires a minimum deposit of $1000-$4999. The type of traders you’re likely to see here are the big moneyed and/or the serious types with quite some knowledge on market analysis and trade strategies. The bonuses are about 50% of the deposit. 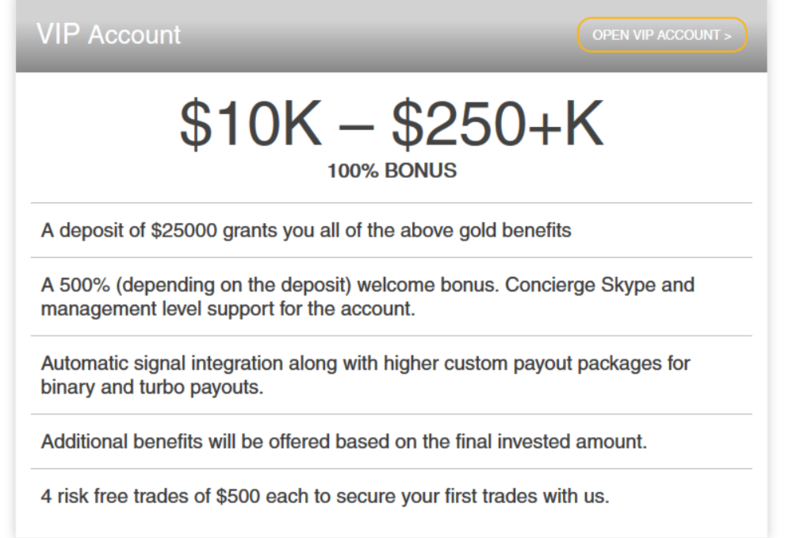 Gold Account – Requires deposits of $5000-$9999 and comes with benefits such as a phone call from GOptions support welcoming you to their site. Slightly higher bonus of up to 75%. VIP Account – As the name suggests, this account is for the big time traders with extensive experience in Stock markets. To open this account you need to make deposits of at least $10000. This account has the highest bonus rate 100% of the deposit. However, to prevent bonus fraud; where people sign up, make a deposit and get the bonus then withdraw and leave, there are bonus withdrawal requirements on GOptions. As a general rule, the bonus is not automatically transferred to the trader’s account unless s/he accepts it. And even if s/he does this, s/he will be required to have a minimum trade volume of about 30 times the bonus amount before withdrawal. The bonus may be used freely for trading. Turbo Options – It is a known fact that GOptions introduced turbo trading in binary options. Turbo is especially popular among traders who don’t want to wait for long to get returns. Turbo terms range from 30 seconds, 60 seconds and 2 minutes. High/Low options – This is the traditional binary trading option. As its name suggests, it is built around the increase or decrease in the performance of an asset. Basically, if a trader believes that the asset will perform better, s/he buys a high option. After the expiration of the trade period, if the assets will have performed above the trader’s prediction, s/he receives his/her money back with a certain payout. If s/he believes that the asset’s performance will decline, s/he buys a low option. If the assets perform lower, the trader will get his/her money back plus a payout. However, if the asset’s index remains constant, the trader will get his/her exact money back. 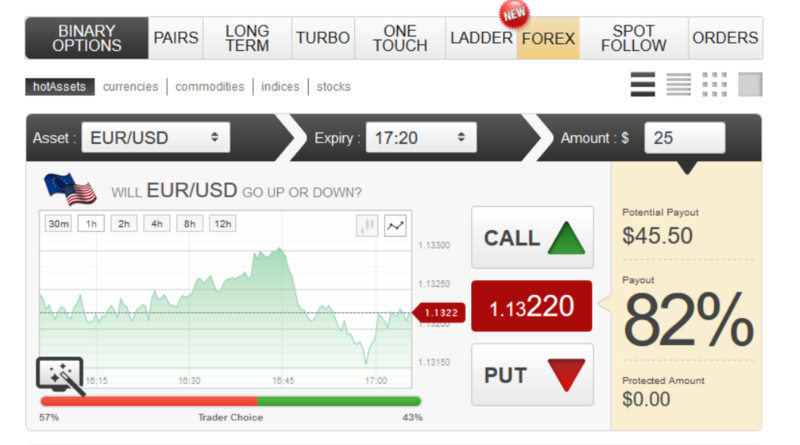 Ladder options – In this option, the trader chooses multiple prices and places stakes on them. This is one of the highest paying options with a payout of up to 1250%! Option builder – In this case, the trader has the freedom to choose what to trade in and how much to put in. The trader also gets to choose his/her profit level and insurance cover to protect against loss. It is not subject to the normal terms of the trade as the trader gets to determine his/her own expiry date. The option builder is most popular among traders with market knowledge and experience. GOptions also has a mobile app that is compatible with Android and iPhone devices. The app is developed in such a way that it is very easy to use with a simple structure. With the app on their phones, traders can get the latest information on the market, look up their trades and basically transact business all from around the world. All one needs is a working Internet connection. This increases it’s convenience since now almost everyone has access to a Smartphone and Internet. The app is available on Google Play Store for Android and Apple Store for iOS devices. GOptions deals in a wide variety of assets from stocks to trusts to currencies. Their notable assets include Apple Inc, Microsoft (USA) and Tata Motors among others. The assets are fewer compared to other brokers but GOptions can be said to choose asset quality over quantity. Besides, not many will note the absence of other stocks in GOptions index as long as the big players in the market are there. The measure of a great broker is based on how they pass knowledge to their traders. GOptions has plenty of educational materials including video tutorials, weekly webinars and a wonderful customer support team. All this, plus an experienced Personal Account Manager work towards making the trader comfortable while at the same time imparting knowledge on the market. If a trader made proper use of the available resources, there is no doubt that s/he will be an expert in no time. And richer too, of course! For a binary options broker, a good and reliable signal means increased investor confidence, which in turn means good business. GOptions uses Signal Index which pretty much does all the hard work; it uses its massive database and “experience” to determine where and what to trade in. It then sends a signal and automatically every account signed in to the signal make a trade. The efficiency of the signals is quite awesome but could do with some improvements. Having been in the binary trade for a while, GOptions has had its fair share of successes and failures and to their credit, have continued to improve their product especially the support service. While its customer relations are quite commendable, GOptions should make some effort to increase the number of languages available on its platform since it is slowly turning into a global leader in binary trading. And one of the surest ways to convince people to invest in you is by speaking their language. They should also work on incorporating PayPal into their banking system as it is one of the most widely used payment services in the world. All in all, GOptions is a good choice for anyone interested in the options trade, and judging by the way they’re going, it is only right to say that it will be a global phenomenon in a few years time. For anyone who is not quite sure of how to go about this whole options thing, you can deposit with your broker of choice, sign up with Binary Option Robot and sit back and enjoy profits. Binary Option Robot is a software that basically “trades” for you like a human being would, but with a higher success rate than any human ever. Don’t worry about losing your investment since the Robot gives you a choice on how big a risk you are willing to take. With higher risks associated with higher returns. Do Reuters spreads reflect currencies’ differences in global trading activity?